Raising children is a great gift that life can give us, however, at times it can truly be difficult. The adolescent years are especially hard on your patience as you ask yourself how your child developed such an extensive vocabulary. This is when you look back on the early years of diapers, naps, and the total and complete lack of speech as a true time of serenity. You seem to regret that you did not savor the times when your child did not have the ability to talk back. This reflection makes you ponder a deeper question. How did humans develop language? Humans are differentiated by all other species in their ability to communicate through language. Although humans and primates are closely related and share common ancestors, primates lack the mechanisms to formulate speech (for chimpanzee vocalizations: http://www.junglewalk.com/Asounds/chimp2.wav). There are many reasons leading to these differences, such as physical and intellectual barriers between the two species. Humans are different in that they have a vocal cord enabling a diversity of sounds to be produced (1). They also have smaller tongues that are highly innervated, and very sensitive allowing movements that produce specific sounds. Human hearing has had to adapt in response to language development. The human ear is highly specialized to hear small differences in language from 1 kHz to 4 kHz (1). This sensitization is important, as the range in frequency is the range elicited by sound from the vocal tract. In Darwin’s book, The Origin of Species, he suggests that evolution occurs by natural selection, where certain traits enhancing survival will be passed on to future generation (2). The gap between primates and human language can be explained through natural selection favouring the physical capacity for speech. Random mutations produced a change in the shape of the mouth, tongue, larynx, and hearing of humans. Evidence of this can be seen by the development of the larynx further down the throat of hominids 150, 000 years ago (3). 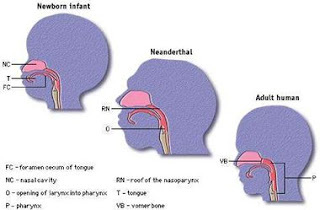 When comparing Neanderthal development to human, the larynx of the Neanderthal was short like that of an infant making it difficult for speech formation. Hominids developed the physically capacity to speak, however, the change in laryngeal shape facilitated choking and was actually a disadvantageous feature for survival (3). In order to accommodate to the physical development, the brain would have also evolved to process language. The hominid brain grew larger in size with mental stimulation from the use of tools, producing specialized centers (4).This specialization differentiated further creating a left brain dominance for the processing of language. 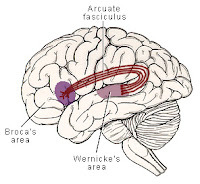 Today, humans have two areas predominantly in the left hemisphere called Broca’s and Wernicke’s area. Broca’s area is responsible for language initiation and production, while Wernicke’s area is the center for language comprehension and meaning (5). Damage to these areas result in speech loss or problems in comprehension, regardless if the physical ability to speak is present. The brain and body both have had to develop simultaneously in order to progress from the inability to speak to modern day human language. This development occured slowly over thousands of years as language gained a selective advantage. What will be seen with the progression of our civilization now that humans have developed many languages to communicate with? It is unlikely for the world to develop one common language but perhaps people will come to learn a few dominant languages. With the progression of the Internet and technology, one could only assume that we will become better at processing information. Only time will tell what differences will arise and how our brains and bodies will evolve in the future. A short film on the development of human cognition and language. May I suggest a book? The language instinct by Steven Pinker.....all of his books are very good !